Reaching the century mark in age is no big deal to Hubert Edwards. When you ask him what it’s like to be 100 years old, the Beaufort County native replies with a humorous, simple answer. “You have to ask someone older than me, I don’t know,” he said. One of the first questions commonly asked to centenarians is about the secret to longevity. Mr. Edwards, who admits he’s been asked the same question time and again, says the answer is fairly simple, at least in his case. He and his wife, Lynda, have only been married for 11 years, but she’s one of the reasons he’s remained in Harnett County in the twilight of his life — Mrs. Edwards and his daughter, Gail Surles. Mrs. Surles kept insisting he come live with her and her husband, Jim, in Carolina Lakes while traveling back and forth from Fayetteville to Washington, N.C., when Mr. Edwards was battling colon cancer. It wasn’t until later he finally decided it was time to accept their offer. Those couple of days turned into the rest of his days. Little did he know he would meet his second wife, Lynda, in a relatively short amount of time. After volunteering at area nursing homes to help pass the time, he heard about dancing at an area senior center. It was just a matter of time before he met Lynda. After a few dances and a few more meetings, the couple decided it was time to marry. 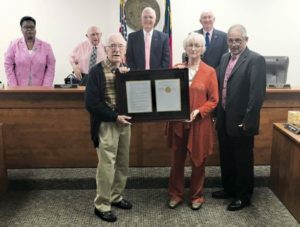 The Harnett County Board of Commissioners honored World War II veteran Hubert Edwards with a proclamation honoring his 100th birthday. Seen accepting the proclamation are Mr. Edwards, his wife Lynda and District 5 Commissioner Joe Miller. Also on hand were Commissioners Barbara McKoy, Abe Elmore, Gordon Springle and Howard Penny. After joining the Army in 1941, he married his first wife before going to England to train for the invasion of North Africa, one of seven operations he took part in as a member of the 17th Field Artillery Battalion. He spent 37 months overseas on the front lines of the European Theater. He participated in campaigns which took him to Tunisia, North Africa, Sicily, Naples-Foggia, Rome-Arno, Southern France, the Rhineland and Central Europe. He described his job as something very common to the American solider then and now. When his time was over, he had earned a Silver Star and two Bronze Stars for his service. He was also qualified as a marksman for both pistol and rifle. Those accomplishments are just one small part of the life of a man who left the military to work for International Harvester and General Motors in the parts and service department, before working a as production manager for Hamilton Beach in Washington. He also forayed into the political arena when, in 1968, he was selected as Beaufort County campaign manager for U.S. Sen. Robert Morgan of Lillington during his campaign for North Carolina Attorney General. He spoke of the first meeting with Sen. Morgan after being presented with a proclamation in honor from the Harnett County Board of Commissioners.